Produktinformationen "18s 12ND930 8 Ohm"
The 12ND930 is a high power, high output, low frequency woofer meeting the most stringent requirements in high quality professional transducers. The high level of performance and sound quality have been achieved by exploiting the most advanced technologies available today. Thanks to its versatility, the 12ND930 can be used in two-way compact reflex enclosures with a 1.4" compression driver, in multi-way systems and in high loading sub woofers as small as 50 lt (compact reflex, band-pass and hornloaded configurations). The neodymium magnet assembly assures high flux concentration, low power compression and excellent heat exchange, since the external magnet configuration is considerably more efficient than traditional under-pole magnet topology. This results in high levels of force factor and power handling with an optimum power to weight ratio. The direct contact between the large heat sink and the basket, together with the magnetic structure, represents a fundamental improvement in thermal connection and heat dissipation. The result is increased power handling capabilities and lower power compression. The curvilinear cone profile, created with a special high strength wood pulp, has been designed to achieve the best possible linearity within its frequency range. The cone surround in linen material is highly resistant to aging and fatigue. The in-house developed cone treatment is a humidity repellent and significant dampens bell mode resonance. 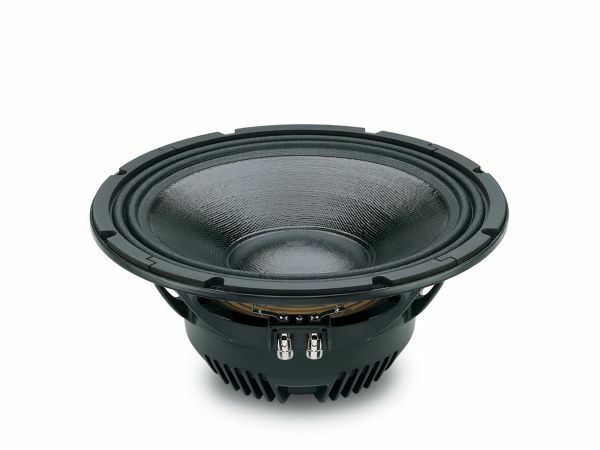 The 12ND930 employs our Interleaved Sandwich Voice coil (ISV) in which a high strength fiberfiberglas former carries windings on both the outer and inner surfaces to achieve a mass balanced coil. The final result is an extremely linear motor assembly with a reduced tendency for eccentric behavior when driven hard. The already low distortion and sound quality are further improved by Double Demodulating Rings (DDR), that flatten impedance and phase figures with a constant power transfer. A special coating applied to both the top and back plates makes the 12ND930 far more resistant to the corrosive effects of salts and oxidization. Weiterführende Links zu "18s 12ND930 8 Ohm"
Kundenbewertungen für "18s 12ND930 8 Ohm"